This little bunny featured in our embroidery design is not just adorable but hard-working too! It’s busy getting ready a festive garland made of stars and carrots. The cute bunny is quite fluffy; it’s wearing a long purple scarf. Another great thing about this design is the choice of colors: iris, lemon, chocolate, honeysuckle, pumpkin, mushroom and tulip among others. 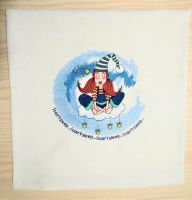 There are so many items you can use this original needlework for: kids’ stuff like T-shirts, hoodies, sweaters and pajamas or home decor items like towels, napkins, blankets, cushions, bathrobes, quilts, gift boxes and much more. 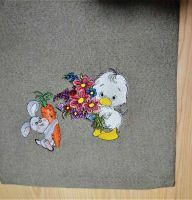 I bought this pretty bunny design, but I have no idea where to stitch it out) More precisely too many ones. It's difficult to choose. I wonder if it is appropriate for summer? 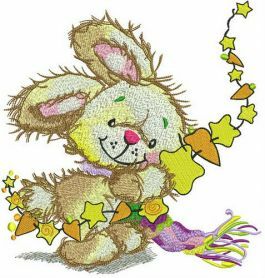 I wish I could embroider the Stars and carrots garland for the bunny on a summer skirt. Anyway, I'll stitch out the digital design for Christmas. Hope it comes out perfectly. Nice pattern for a baby interior decoration. 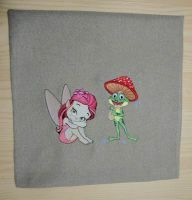 Embroidered it on several pillowcases. I hope our baby would sleep sweetly on such a sweety))) Pretty bunny!